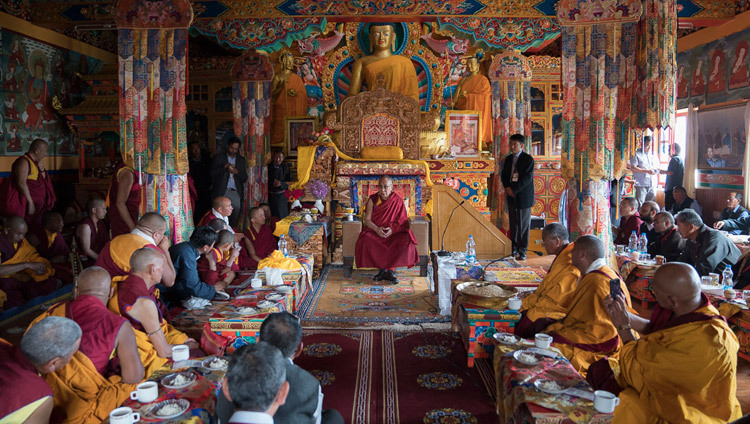 Leh, Ladakh, J&K, India – The sun was blazing hot when it broke through scattered clouds this morning as His Holiness the Dalai Lama turned off the main road at Choglamsar and crossed the local bridge over the River Indus. Schoolchildren and local residents lined the road to greet him as his car drove through the villages of Chuchot Yakma, Chuchot Shama and Chuchot Gongma. Near the edge of the valley, the arid, sandy landscape gave way to neat walls around green fields punctuated by willow groves. The road began to climb, culminating at the entrance to Matho Monastery standing on a hilltop with a sweeping view back to Thiksey and Shey. His Holiness was welcomed in traditional style by the monks of the monastery who, wearing red hats, escorted him to the assembly hall. The narrow way was lined by women ornate in their peraks, the traditional headdresses studded with turquoise, bright flowers in their hands. Before a grand statue of Buddha Shakyamuni flanked by his Arhat disciples His Holiness was invited to light a butter lamp. He then bowed his head in salutation. At a window to the side he paused to gaze out and take in the verdant local landscape. Once His Holiness had sat down, tea and ceremonial sweet rice were served while the assembly recited a prayer for his long life composed by his two tutors. In response to his enquiry, he heard that the monastery had been founded in 1410 and that Sakya Dagtri has spent time there. Matho Monastery is renowned for its collection of old thangka paintings, some of which date back to the founding of the monastery. In an adjacent hall His Holiness was shown examples of work a team of foreigners have been doing to clean and restore such paintings. Seated at the top of the steps on the monastery veranda, His Holiness addressed the crowd in the yard below. “My dear Dharma brothers and sisters, I’ve been invited to lunch with Ganden Trisur Rinpoche at his family home down the hill today, and decided to visit your monastery too. I consider it’s important to pay respect to all religious traditions whenever you can, so I’m very happy to be able to visit this Sakya monastery. “The Sakya Tradition, beginning with the three founders in tantric robes and continuing with the Five Patriarchs, has included many great scholars and practitioners of the teachings of sutra and tantra. To this day we remember the erudite Sakya Pandita for such works as his ‘Treasury of Logic on Valid Cognition’ and his ‘Discrimination the Three Vows’, as well as his studies with the Kashmiri Pandita Shakya Shribhadra. “Lately, I’ve been urging people who follow our Buddhist traditions to become 21st century Buddhists. What does this mean? According to the great Indian master Vasubandhu the teachings of the Buddha can be classed as scriptural and experiential. To preserve them and keep them alive we need both to study and develop experience of what we’ve understood through practice. This means we should read the contents of the Three Baskets of scriptures and apply what we learn by exercising the Three Trainings in ethics, concentration and wisdom—in other words, study and practice. “In the past the general public didn’t study very much. They might recite the scriptures, but they didn’t feel a need to investigate their meaning. That’s what we need to do now, study philosophy and logic and integrate what we learn into our day to day lives. “There were many monasteries in Tibet in the past, but study of the classic texts only took place in those that were called centres of learning. Study should no longer be confined to the colleges. We all should learn what Buddhism is really about. 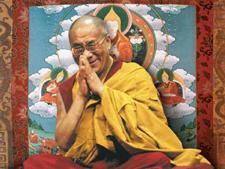 His Holiness mentioned that later in the month he will be giving public teachings, but told his audience that he would like to give them transmission of the mantras of Buddha Shakyamuni, of Avalokiteshvara, the embodiment of compassion, Manjushri, the manifestation of wisdom and Arya Tara, the expression of enlightened activities. As is his custom, His Holiness reached out to many in the crowd as he walked slowly back to his car. From the monastery the road wound down the hill to the Matho Phodrang, the family home of the Matho royal family, where Ganden Trisur Rinpoche was born. Rinpoche, his sister and other members of the family met His Holiness at the door to the new house and escorted him upstairs to a sumptuous lunch.